Shabby-Chic is the most feminine style out there today. This style brings pastel colors with a hint of a vintage look to create a romantic flow. It also uses floral patterns and lots of white to show a cozy cottage feel. 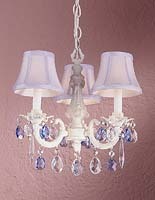 But on the other hand, Shabby-Chic can be all about the sparkle of a few beautiful crystals. Whenever you think of a little princess’s room with ruffles, you’re thinking Shabby-Chic.